It’s a mixed bag so far out there today for binary betting, with the FTSE and CAC opening up virtually unchanged, while the DAX has opened down 0.6%. Banking shares are down on speculation that the G20 clampdown on the sector will hurt profit margins at the remaining independent players such as Barclays. Commodities are also slightly off the boil with daily oil prices dipping below £72 and the spot gold price just 2 points above the $1000 level. With little economic news for investors to chew on today, it could be a tepid session with the FTSE 100 unlikely to make a meaningful break above the 5190 resistance level. A no touch trade with the trigger set to 5195 could be a good way to play this if the FTSE manages to rally today. With Japanese traders away from their desks due to a national holiday, the yen is on the back foot against a basket of currencies, most notably the US dollar. The resurgent greenback is on the offensive on speculation that the Fed will end its stimulus programs. The USD/JPY is up 0.77% while the Yen is also down by around 0.5% against the euro. The pound is once again being hit, falling 0.6% against the dollar and rising by only small margin against the yen. 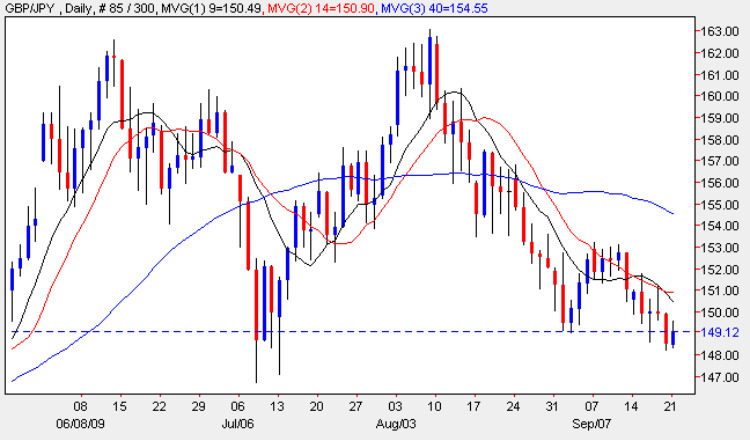 Speculation over government spending cuts may be having a disruptive effect on traders’ confidence in the UK currency. With Japanese traders away for the day and the pound weak against most other currencies, a my binary betting trade is a No Touch Higher on the GBP/JPY which could be the best way to play the pound today.